Master bathrooms are one of the most popular renovations projects in a home. In a recent study conducted by Houzz, many homeowners are prioritizing style, lighting, & resale value for their remodel, while also noting the ease of its cleaning & maintenance. Of their findings, they also discovered that many are remodeling with aging in mind, too. While the thought of aging in place design here may conjure up thoughts of nursing homes bathrooms that lack in style, selections & features for these types of master bath renovations are anything but understated in fashion and appeal. Accessibility & Layout – Many homeowners who are currently renovating or are planning to do so, are addressing age-related needs as part of their master bath project. With this in mind, layout and accessibility are two of the focus areas. 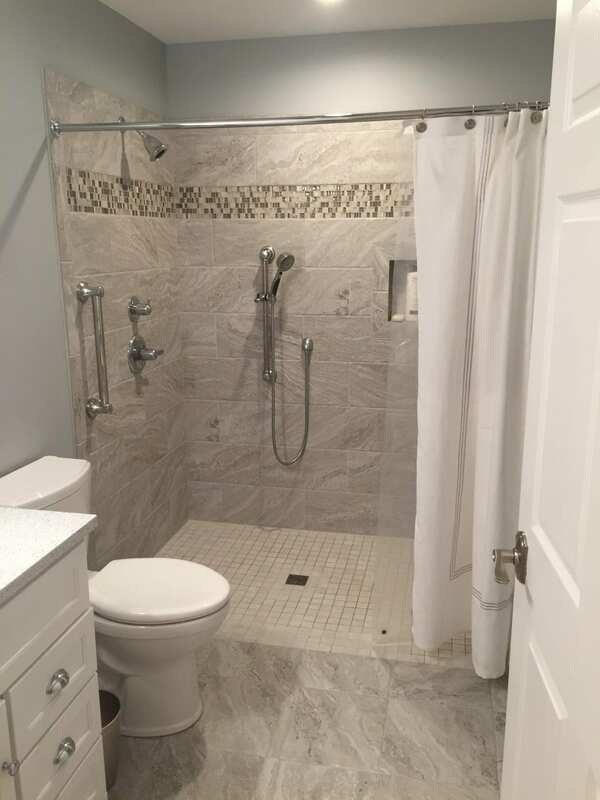 Homeowners are making adjustments to the layout, or “flow” of their bathroom to accommodate future hindrances that may interfere with usage & availability, such as the actual size & space of the bathroom and the potential of having to utilize a walker or wheelchair. While having a larger or more-open master bath can aid in accessibility, it can also instill a sense of spa-like luxury, too—perfect for accommodating relaxation at any age! 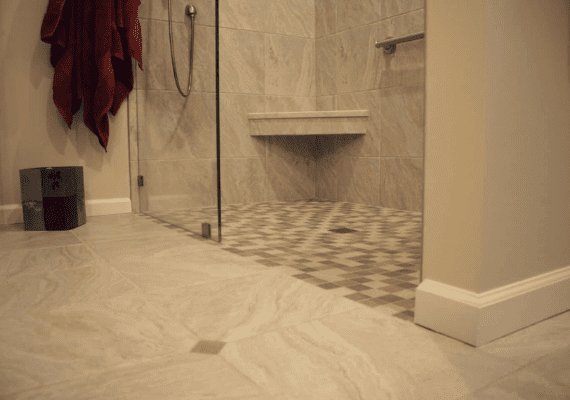 Curbless Showers – Looking to the future, the possibility of needing a walker or wheelchair has some homeowners opting for curbless showers for their master bath renovations. Curbless showers look & feel modern but ideally makes transitioning in and out easy and safe for those who may become limited in mobility. If this is a desired feature for you, you’ll want to hire a professional who is experienced in this type of project area, as they will need to understand the principles of slope for drainage. Additionally, proper waterproofing will be needed for this feature, too. Benches – You don’t have to be beyond the 55+ age mark to utilize a bench in your bathroom. 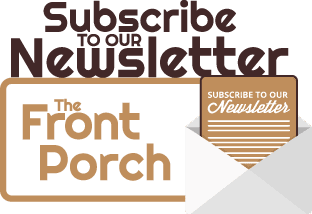 Benches allow for comfort and safety as homeowners go about their daily routine. They can be utilized both at the sink and in the shower. Many homeowners choose to do built-in benches in their shower, though if you’re tight on space, you can choose to do a wall-hung bench that folds up when not in use. Whichever you prefer, be sure it is made of moisture-resistant materials, such as plastic, cedar, or teak. 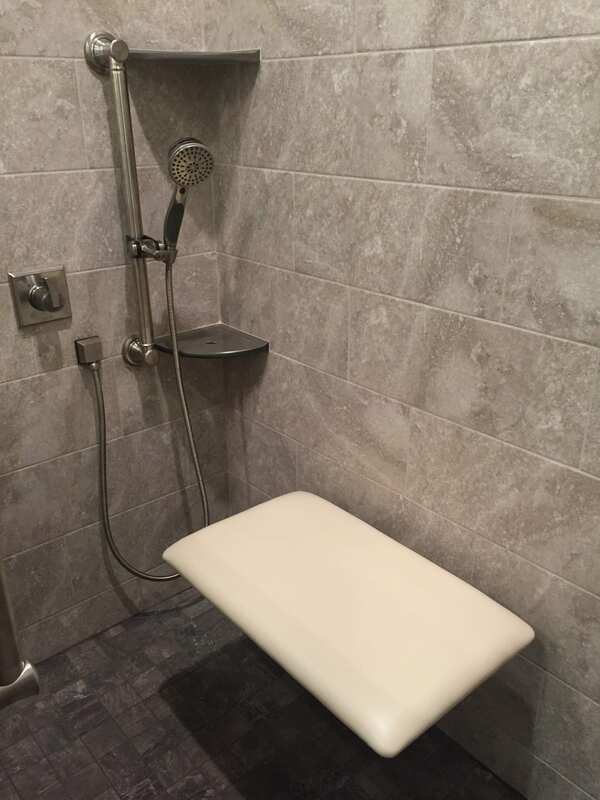 BONUS: if you want a built-in bench in your shower, consult with your contractor or bathroom designer for design & style ideas; some may allow for unique tiling and/or seating options. Handheld Shower Heads – When renovating a master bath with aging in mind, consider choosing a handheld showerhead, especially if you plan to incorporate a shower bench, too. Handheld shower heads allow for one to easily shower while sitting and direct water where needed. Homeowners can opt to install a showerhead that doubles as a handheld or two showerheads that diverts water to the handheld when needed. BONUS: handheld showerheads also allow for easy cleaning for pets & young children who need a quick scrub! Grab Bars – The idea of aging in place has fortunately been embraced by both designers & manufacturers. Today, there are a variety of grab bars that are both contemporary and sleek and invoke a sense of style rather than just its evident function. If you want to install grab bars in your master bath renovation but aren’t necessarily in need of them just yet, this may be important to know! Again, consult with your contractor and/or designer, as they may be able to help guide you in the selection process. Master bathroom renovations will continue to be popular among baby boomers, gen. x-ers, and generations that follow. When contemplating this type of renovation project, it’s important to reflect upon these two factors: your age, and how long you plan to stay in your house, as both these matters can impact your selections & renovations. Regardless of what you decide, you’ll ideally want to hire a professional contractor, so that your remodel increases the value of your home.